1. Stepping on the brake pedal with left foot. The left foot should be placed on the foot rest is provided. "The sensitivity of the left and right feet are different," he said. In addition, pressing the brake with your left foot while the right foot remains on the gas pedal can shorten the life of the transmission. 2. Habit in the manual transmission if you stop, always press the brake pedal. These habits often carry over. Though the automatic setting, without in any gas, the car can run. This means that by holding the lever in position D and press the brake pedal while stopped for a moment mean to let the transmission still works. Should stop when the lever is moved to a position N/Neutral, or P if a relatively long time. Matic always more extravagant than the manual. But there are ways to make it more efficient, even more efficient than manually driven not by way of saving. 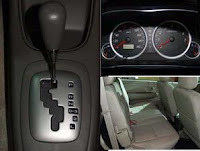 Bintarto split 7 ways to save with automatic transmission for you. 1. Keeping the engine in prime condition and perform pre-trip inspection prior to travel. 2. Keep the engine speed at round 2000 - 3000 rpm. It is the economic zone where the engine torque at maximum point. "Hit the gas pedal gently, not excessive," he advised. 3. Avoid excessive acceleration and braking. "If there is traffic in front, ngak necessary in gas then brake, but just let the car flow by lifting the gas pedal slowly." 5. Check tire pressure if it is in accordance with the recommendations automaker. Check when the tires in cool conditions. "Always refer to your owner's manual or the sticker taped to the door." Turn off the AC if it is not necessary. Entering a new car parked in the heat, do not immediately turn on the AC. Better glass wide open and let the winds dissipate heat in the interior, as well as toxins that evaporates from the automobile dashboard. Once the heat goes, the new glass lid and turn the air conditioner. The cold night air conditioner did not need excessive. It all helps save gas.